How is your Christmas shopping going? It’s still early in the game and most people belong in one of two categories. Group 1) Done. Done six weeks ago. Silently gloats about being done, but refrains from shouting it from the mountain tops because it’s Christmas and that would be rude. Christmas cards are done too. Check. Bam! Group 2) Not even begun. That first gift hasn’t been bought. The first store has not been entered. What month is it? Really, it’s December? Hmmm….I should get on that. I belong in group 2. I haven’t started. I have ideas, good ideas at that, but nothing purchased, nothing wrapped, nothing layed away, nothing being shipped. Nothing. At least nothing for anyone on my list. Unless my name is on said list. Yep, I have bought more for myself, yet again, than for anyone else. Way more. It is the deals, the price cuts, the free shipping. All on items I kinda sorted needed/wanted/drooled over for some time. That makes it OK, right? It is a selfish act and not in the spirit of the season…but 65% and free shipping…it’s like they are giving it away! So, I have stayed away from the mall because, while the need to start shopping is there, the temptation of personal purchases is still too great. Therefore, until I get myself under control…I am staying right here, smack dab, in the middle of my kitchen. Knee deep in butter and flour and rocking out to Josh Groban and Trans Siberian Orchestra. I prefer it here anyways. So, what do I have up my sleeve for cookie # 3 in my month of cookies? 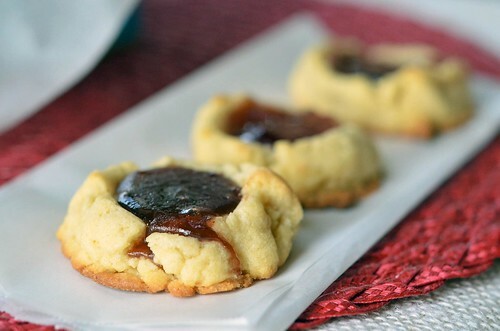 Rich, tender, soft, melt in your mouth butter cookies. These cookies have it going on. So simple, but so decadent. Perfect with an afternoon cup of tea or with a cup of hot cocoa after dinner. Do you have some one in your life who claims not to be a sweets eater ( I believe to my core that these people are lying by the way…just sayin’) Butter cookies will be their weakness. Guaranteed. They are not overly sugary, but moist and buttery. Did I mention they just melt in your mouth? They do. 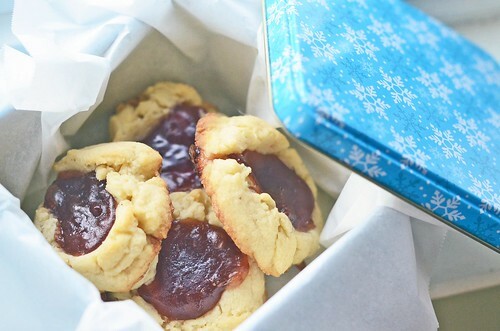 And to make them even more special and festive…take that thumb of yours, create a crater in the cookie dough, and add a dollop of your favorite jam. 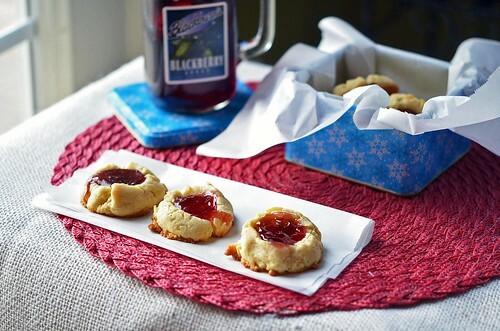 Tah dah… Butter and jam cookies. It is that simple people. 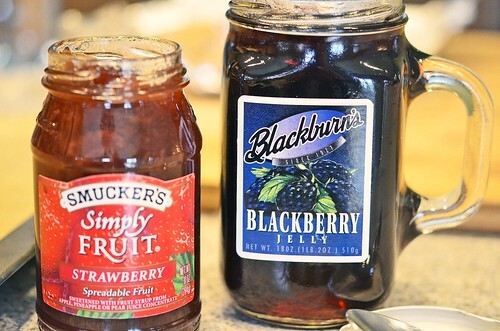 1/2 Cup Jam – I used Strawberry and Blackberry, but cherry is amazing and I am dying to try apple butter. In a medium/large mixing bowl, beat together butter and sugar. Add egg yolks and vanilla and continue to beat until incorporated. With mixer on low, slowly add flour. Beat until dough comes together. It will be rather crumbly at the beginning, but it will come together, just keep blending. It will be a smooth, thick dough. 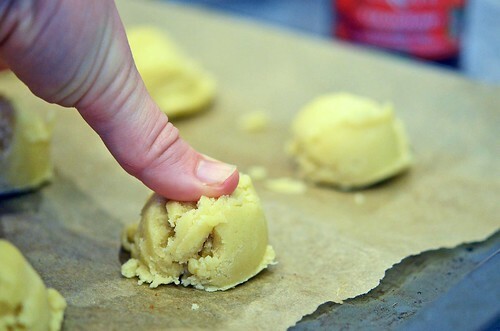 With a cookie scoop or teaspoon, scoop dough out and shape into balls and place on a ungreased cookie sheet, about one to two inches apart. They do not spread, so no worries. Take your thumb and create a wee crater in the middle of each dough ball. Just a small indentation. Place about 1 teaspoon of jam in each crater. 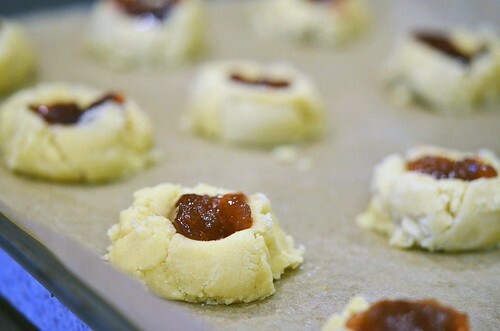 If you prefer no jam, then take a fork, dip it in a bit of flour, and lightly press each cookie down creating a cross thatch design. Place cookies in preheated oven for 8 to 10 minutes, or until the bottoms are slightly golden brown. Remove from oven and let cool on cookie sheet for 3 to 5 minutes before transferring to a wire cooling rack. Oh and I should admit that I bought the blackberry jelly simply because of the jar. I have sense realized that it’ll take me eons to eat all of that jelly. Duh.